Our New Blog is now alive! The url is www.unyg.com/blog/ - or just click the tab UNYG Blog above. On this website you will learn many tips, tricks and sources for genealogical research on ancestors that lived in the Upstate New York communities from the Colonial Period onward. The genealogies published here are from our own ancestors, and are just capsule formats of basic data on each person. The compiler has complete versions at hand which cite all sources and documented facts with a great many notes and comments. We will gladly add anything that you might be able to supply, or will cheerfully correct any errors or omissions. Please contact us for details. We LOVE to trade data! 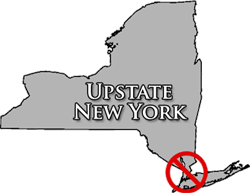 To read our Upstate New York Genealogy Blog, click on "UNYG Blog" tab at the top of this page. We have had several inquiries as to “How can I help Upstate New York Genealogy”? Well there are two ways. 1st - send questions and comments, the life’s blood of all Internet publishers, and 2nd - is to visit our tab marked “UNYG Affiliates”. We appreciate your participation tremendously! Read it on the UNYG Blog . This is a great review website for all things having to do with DNA Genealogy Testing. Is Google getting into DNA testing?